I wanted an apron with some feminine appeal, so here's the apron design that had me up late figuring it all out. Overall, I'm happy with it. I made the ties long enough to either tie the apron in front or with a big bow in back. The neckband has a snap closure and I'm debating about adding a pocket. I love aprons that are full length because I'm a very messy cook (which is also the reason behind my use of a dark fabric for the main part of this apron - it should disguise messes better ;o). There's still some "tweaking" I may do on my idea thanks to this prototype. Makes me wish I had a sewing/dress mannequin to work with. It would definitely speed up the process of trial and error that occurs when I only have myself to do mock-ups on (and then I could use it for the photographs!). 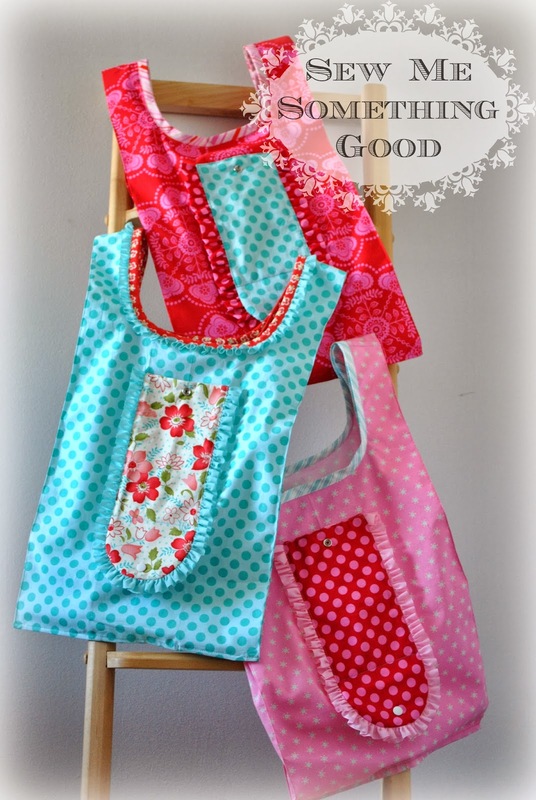 Want the chance to win a lovely apron from Flirty Aprons in a giveaway? Go here and leave a comment before Mon. Mar. 31 st to enter. First there was the late nite spent envisioning this project. Here's a glimpse of the work in progress. Staying up late is easy when I combine two things I enjoy, such as sewing and either watching old movies on the portable dvd player or listening to an audiobook. I call it multi-tasking ;o) Last nite was spent enjoying Audrey Hepburn and Cary Grant. A good movie does help my creative process. I have been slowly amassing a stash of vintage sheets for re-purposing. Today, I dove into this lovely blue assortment to cut out pieces for a quilt. and you can see there's some carpet showing where I need to put a couple more pieces, but I've used every blue sheet or pillowcase I've collected. to make some of the softest, most comfortable lounge pants. Of course you can skip the pillowcases and use vintage sheets to make the lounge pants, like the ones shown above. I added some interesting contrast to the lower leg by using strips cut off another sheet rather than purchased trim as the pattern suggests. 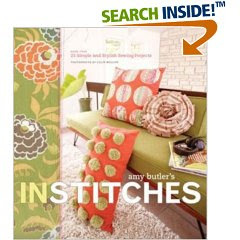 The basic pattern for these lounge pants is found in the book, In Stitches by Amy Butler. 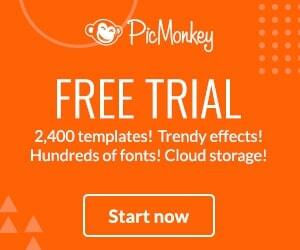 Pay It Forward - Sign up here! I don't know what my 3 gifts will be, and I can't make them in the next few weeks, but I can promise I will send them within the next 6 months . The colours of Spring. 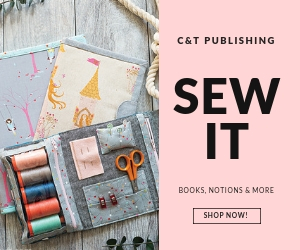 I made this wristlet and needlebook for my recent giveaway, but I liked the fabrics and colours so much that I had to make something more in them. Here's the results of some weekend sewing time. I'm really liking the pink dots for the bag's lining. Please excuse the appearance of pins - I'm not quite finished hand sewing the bias binding on the top inside edges. Doesn't this set say "Spring" to you? ** Oh, for those of you that are wondering which prize Andrea chose from the giveaway offerrings... she decided on #1. Many thanks to all of you for participating in the giveaway and helping me celebrate the arrival of Spring! Choice #1: A bag made from vintage fabric. Choice #2: A needlebook and matching drawstring bag, both quilted patchwork. Choice #3: A reversible apron featuring Mary Engelbreit fabric and a flower shaped pocket on the front side. Choice #4: The same bag as #1 made from a different piece of vintage fabric. Choice # 5: A retro shopper bag made from a crazy patchwork printed fabric. Choice #6: A zippered wristlet and a linen, hand embroidered needlecase; both made in spring time colours. 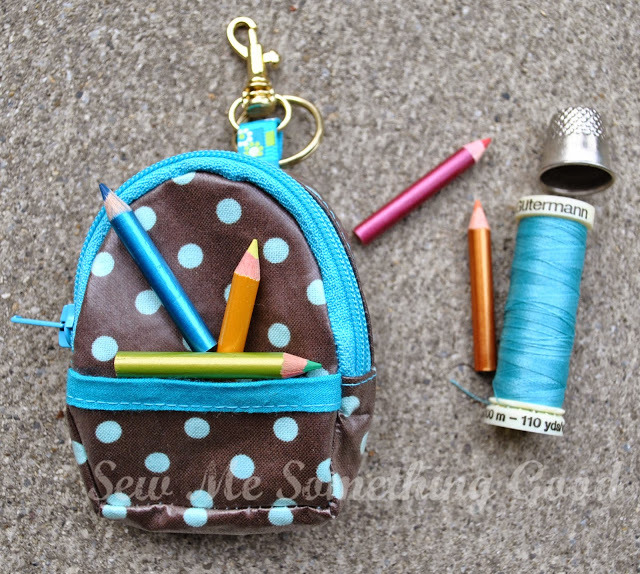 (A peek at the inside of the wristlet and the needlecase). Lissa Jane is the winner of the linen front bluebird pouch given as a bonus prize!!!!! She is the person responsible for referring the most people to my giveaway. Congratulations to Andrea and Lissa Jane! I hope you'll be happy with your prizes and thanks so much to all you wonderful bloggers for playing along in my giveaway. You all left such lovely comments and made this a fun giveaway. I'm already looking forward to hosting another one as I enjoyed doing this so much. I'm also excited to check out everyone's blogs that came to visit me during this past week. I really appreciated hearing from you and look forward to getting to know you and I hope you'll continue to visit here. Today's the day I draw a winner for my Spring giveaway (see pictures of the prize choices here) and I will also send this bonus prize to the person responsible for referring the most people to my giveaway. You still have some time before I stop taking entries for my Spring giveaway. Hurry though! I will be drawing a name at noon today and that winner will get to choose her prize from among six items that I've made. 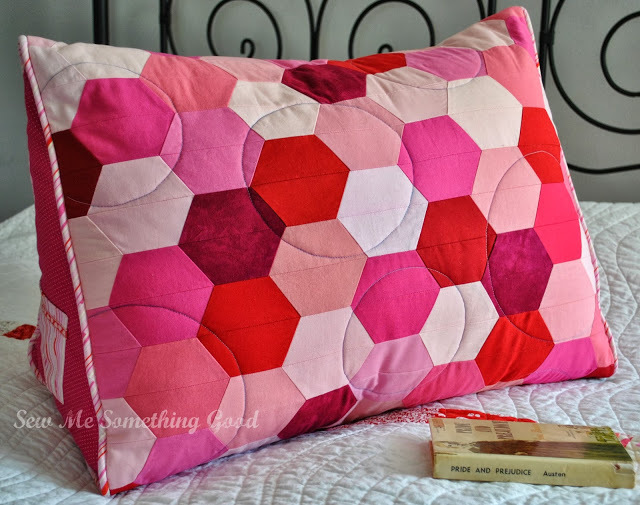 I just have to let you know about the amazingly generous giveaway Dana is having over at Old Red Barn Co. Go enter for a chance at winning a beautiful quilt and other goodies. It seems I'm working on a collection. 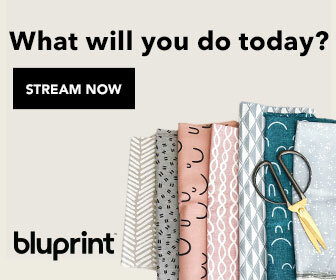 It must've started when I received vintage patterns that were my great-grandmothers. Add to that my love of old movies and the great styles from bygone years. Now, perhaps that would explain how these charmed their way into my basket at the first thrift store stop yesterday. It seemed I had some good thrifting mojo with me and I did have errands in another part of the city (hear me rationalizing my thrifting lust here? )I thought I'd stop at another local thrift store for a look see. I was looking for zippers, but when I come across interesting cotton fabrics - I don't hesistate bringing them home with me. Shown next is one of the best things about this particular thrift store. After the grandmotherly volunteer added up the cost of my fabric, she scooped up all of the patterns and notions I had on the counter, stuffed them into my fabric shopping bags and didn't charge me for them. Yeah. You read that right. Shown below is what I got for free. Oh, yeah, I did find the zippers I originally went there to look for. What's happening with my giveaway? Due to the technical difficulties I've had in posting photos on Blogger (since I announced my giveaway last Friday), I had time to think about my giveaway. You see, I always like to give a gift that the recipient really likes - which means I try to make it suit their tastes, interests and/or is something that they could use. The hope is that the recipient will enjoy the handmade gift all the more. So, I got to thinking... why not let my blog giveaway winner (you have until Fri. Mar. 14 to enter) choose what she would like best from some of the projects I've sewn? I thought I'd write a brief post to let you know I've been trying to upload the promised photos to my giveaway post and for today's post. Honest. It seems there is some 'server error' preventing me. I will keep trying and hopefully you'll soon get to see what I've made for the giveaway. Thanks for your patience and trust! I want to celebrate Spring with you by having my first blog giveaway! I will try to get photos of the other prize up over the weekend. To win a handmade special something from me, you need to leave me a comment on this post. Tell me what you love about this time of year and you will be entered in to win. to make yourself some funky shopping bags! If you add a pocket to the front of each bag, you can store the bag inside its own pocket for space conservation and convenience. 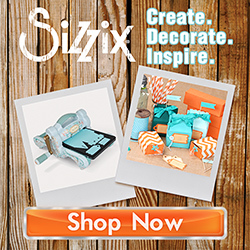 It's all ready to be taken with you on your next shopping trip! Last week on Roxanne's blog she showed a beautiful zippered pouch she'd made, mentioning that she had to hand stitch in the lining. When she asked if anyone could suggest another method, I decided to try my hand at giving a tutorial. 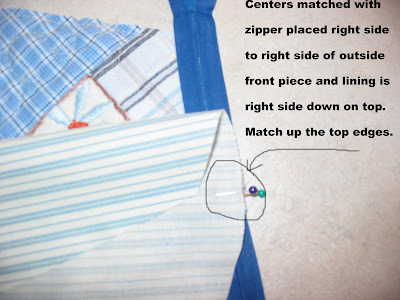 Here's a method that has you stitch in the lining at the same time you attach the zipper to the face fabric. Here's the outside of the pouch, front and back alongside of the lining pieces (the striped fabric). The pins at the top of each piece are place to show the center of the top edge where the zipper will be sewn. Top edge of the pouch front, center marked. Zipper right side up with center marked. Zipper is placed right side (which would be the side you see when you grab the zipper pull to zip and unzip a zipper ) down, with pins that mark center matched up. Keep the edge of the zipper tape lined up with the top edge of the pouch's front piece (which is right side up). Feel free to pin the zipper down all along the top edge if you want. Now, before stitching the zipper to the pouch front, you add the lining piece. Once this is pinned into place, you are ready to sew! I used a zipper foot and sewed 1/4" seam along the top edge. I started and finished this seamline 1/4" in from each side edge. As you can see in the following photo. The reason why I started and stopped 1/4" from the sides, is to help me with making the side seams. Why 1/4"? That is what my seam allowance is for my side seams. By stopping my stitching along the top edge the measurement of the side seams, I can keep the zipper tape out of my side seams which results in easier sewing and a neater looking finished pouch. 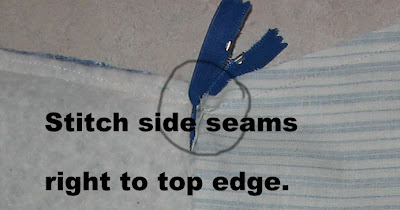 *** Oh, and let's not forget that it should prevent you from accidentally busting a needle because you shouldn't encounter the zipper's endstop (that metal staple which marks the end of the zipper) when you stitch your side seams. After stitching the top edge and attaching the zipper to both the front piece and the lining in just one seam, this is what it will look like with right sides of the front and lining facing up. Now you're ready to do the back and its lining. Again, you're going to make the centers on the zipper tape and the back piece match up with their right sides together. Now you will pin the lining on top of the zipper. The right side of the lining is facing down. You can pin all across this top edge before sewing if you want. Remember to start and stop this stitching the width of your side seam (in my case, this was 1/4" in from the side edge). After stitching this is what my pouch looks like from what will be the pouch's inside. Now you're ready to stitch the side seams. At this point you must UNZIP the zipper. This step is VERY IMPORTANT. If you do not do this you can end up not being able to turn your pouch right side out after sewing. Lay your pieces right sides to rights sides. Lining with lining and pouch front on top of pouch back. Stitch each side seam (this will be four seams), making sure to backstitch at the start and end of each. Sew all the way across the bottom edge of just the front/back pieces and then with the lining you only stitch part way in on this because you need to leave an opening for turning the pouch. **In this pattern the corners are left open for the moment. Here's a close-up to show you that you stitch right to the top edge on each of the side seams. 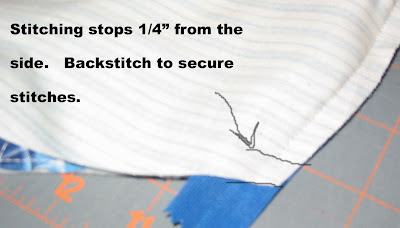 You may prefer using your zipper foot so you can get in as close as possible as you are manipulating the zipper tape out of the way of this seam. You do not want to stitch into your zipper tape. You also must be sure that the zipper pull is located to the inside of your side seam. 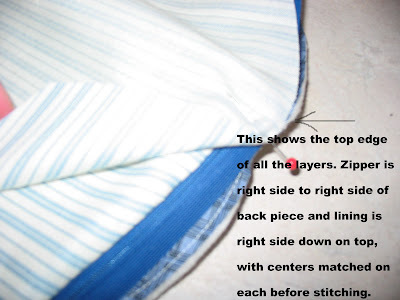 If the pull is not positioned there at the time you stitch up your side seams, your zipper will not be able zip! After finishing the side seams, stitching the bottom closed on the pouch's bottom - remembering to leave part of the bottom of the lining open for reversing; it's time to sew the corners. The open corners are folded so that the side seam and the bottom seam match up. This forms a base. Stitch across the open edge. Here's a shot of the open corners stitched up to form the base in the lining. Note the opening left in the bottom seam of the lining so that I can turn my pouch right side out. Here it is turned right side out. Now all I have to do is stitch the opening left in the lining. The best part of this pouch's design? No handstitching the lining to the zipper!